Moderating laboratory adaptation with the use of a heart-rate variability biofeedback device (StressEraser). Ebben MR, Kurbatov V, Pollak CP. Appl Psychophysiol Biofeedback.2009 Dec;34(4):245-9. Epub 2009 May 6. Difficulty sleeping is a common problem with laboratory polysomnograms. This affects both polysomnograms that are used as a clinical tool to investigate sleep pathology or as an outcome variable in research. The goal of this study was to use a handheld biofeedback device (StressEraser) to improve sleep quality in the laboratory. Ten subjects without a history of sleep disorders were randomly assigned to either a StressEraser or no-treatment control condition. A sleep disturbance scale derived from sleep efficiency, REM latency, minutes of stage 1 sleep, and wake after sleep onset was created to evaluate the differences between these groups. Subjects in the StressEraser group had significantly lower scores on the sleep disturbance scale compared to the no-treatment control group (p = 0.003). Sleep latency was not improved. In conclusion, the StressEraser significantly improved sleep quality compared to a no-treatment control group. This suggests that the StressEraser may be an effective tool to help reduce the first-night effect in nighttime laboratory sleep studies. Accuracy of the StressEraser in the detection of cardiac rhythms. Heilman KJ, Handelman M, Lewis G, Porges SW.
Appl Psychophysiol Biofeedback.2008 Jun;33(2):83-9. Epub 2008 Apr 1. StressEraser is a commercially marketed biofeedback device designed to enhance heart rate variability. 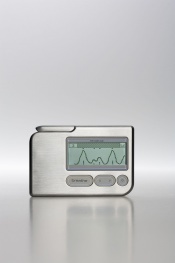 StressEraser makes its internal calculations on beat-to-beat measures of finger pulse intervals. However, the accuracy and precision of StressEraser in quantifying interbeat intervals using finger pulse intervals has not been evaluated against standard laboratory equipment using R-R intervals. Accuracy was assessed by simultaneously recording interbeat intervals using StressEraser and a standard laboratory ECG system. The interbeat intervals were highly correlated between the systems. The average deviation in interbeat interval recordings between the systems was approximately 6 ms. Moreover, correlations approached unity between the systems on estimates of heart period, heart rate, and heart rate variability. Feedback from StressEraser is based on an interbeat time series that provides sufficient information to provide an excellent estimate of the dynamic changes in heart rate and heart rate variability. The slight variations between StressEraser and the laboratory equipment in quantifying heart rate and heart rate variability are due to features related to monitoring heart rate with finger pulse: (1) a lack in precision in the peak of the finger pulse relative to the clearly defined inflection point in the R-wave, and (2) contribution of variations in pulse transit time. De volgende lijst van wetenschappelijk referentiemateriaal omvat de kern van de StressEraser hartcoherentietheorie. Concreet omvatten de studies gepubliceerd onderzoek in de gebieden van hartslagvariabiliteit (HRV), Respiratoire Sinus Aritmie (RSA), parasympathische tonus, nervus vagus activiteit en de juiste ademhaling.